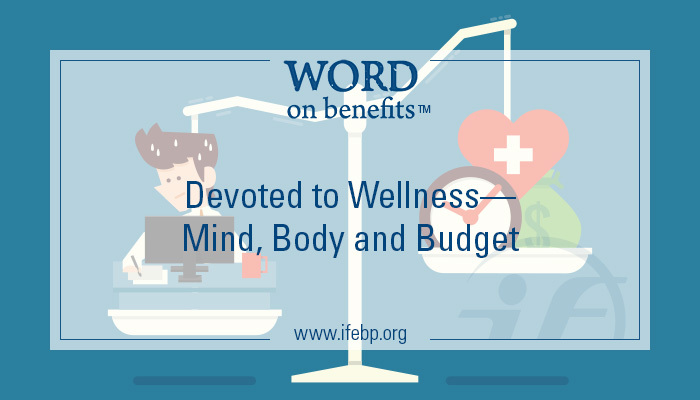 According to Workplace Wellness Trends: 2015 Survey Results, a new survey that will be released by the International Foundation in the coming weeks, more than half (55%) of all organizations have budgets devoted to wellness and more than 80% offer some type of wellness initiatives. What are you doing to support the health and wellness of your employees? 62% say wellness efforts have improved their organization’s HRA/screening data. 54% say wellness efforts have improved engagement survey results. 45% say wellness efforts have reduced absenteeism. 38% say wellness efforts have positively affected their organization’s overall bottom line. Although precise ROI isn’t always easy to measure, it is inspiring to see the transformations that are possible, in individuals and in workplaces, when a sincere commitment to health and wellness is made. Yet many organizations continue to struggle to find the appropriate mix of wellness initiatives, and many others are hesitant to even get started with a wellness program. Promoting health and wellness comes in many shapes and sizes. Some of the more traditional initiatives, like smoking-cessation programs, have been around much longer than others. In recent years organizations have upped the ante, not only in terms of providing a wider array of creative supports but also in measuring the advantages these programs provide. The unique speakers and subject matter at the 2015 Canadian Health and Wellness Innovations Conference give you an opportunity to learn useful ideas that can be implemented into your plan and have a lasting impact on the lives of your employees. Explore new trends, share experiences with other attendees and discuss ways to promote a holistic culture of health. This is the second year the International Foundation will offer a virtual option as part of the conference. The attendee feedback from last year was overwhelmingly positive, in part because this is the only virtual conference of its kind. It is a chance for many people to experience this conference who otherwise couldn’t attend. Whether you attend in person in Victoria or via the virtual conference, you’ll hear Joe Roberts share his inspiring story of how to overcome adversity in his keynote presentation, “From Skid Row to CEO: There’s More to You Than You Can See.” You’ll also learn about the myths of wellness related to obesity and personal responsibility from renowned Dr. Robert H. Lustig from the Institute for Health Policy Studies at the University of California, San Francisco. Sessions also focus on workplace wellness with practical ideas for plan sponsors—The Seven Spokes of Wellness: Creating a Comprehensive Wellness Plan, Benefit Philosophy: Including Wellness in Your Strategic Planning and a case study highlighting how the Halifax Professional Firefighters Benefits Trust implemented various wellness programs, including a mental health peer referral program. The virtual conference is included with registration for on-site attendees and is also available to those who cannot make it to Victoria to attend the conference in person. The virtual environment opens February 22, the first day of the conference, and remains open until May 15, allowing you to access all the sessions and materials at your convenience. Recorded sessions on related topics from the 2014 Canadian Annual Employee Benefits Conference and the 2014 Annual Employee Benefits Symposium are also accessible. Add in survey results, articles and case studies on personal and workplace wellness, as well as a communications centre with real-time chat technology, and you have a wealth of information to assist you. For a preview/taste of what the program offers, view Dr. Robert Reid’s session from last year entitled Is Your Health at Risk? Dr. Reid will be presenting this year on retirement security. View Robert Reid’s session from the 2014 Health and Wellness Innovations Conference. Getting immersed in the latest health and wellness issues is going to be a great experience. I hope to see you in Victoria, or in the virtual environment.